The warm, settled weather continued as we begun the day by wandering down to the metro station. From there we boarded a train to Kungsgården at the end of the Blue Line taking only 10 minutes. 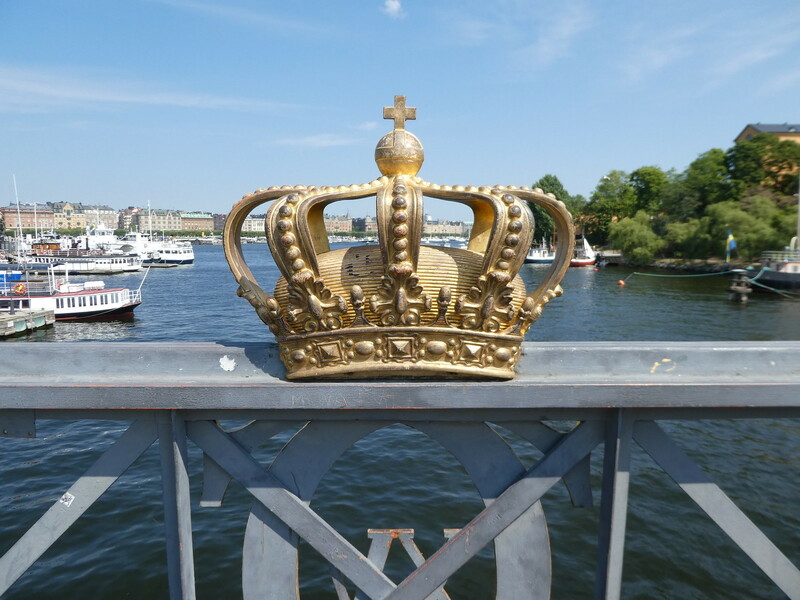 We strolled along the waterfront and across the Skeppsholmen bridge admiring its gilded crowns and stunning views. After a short distance we came across ta sign for a toy museum that appeared to be built into the rock, so we went along to investigate. 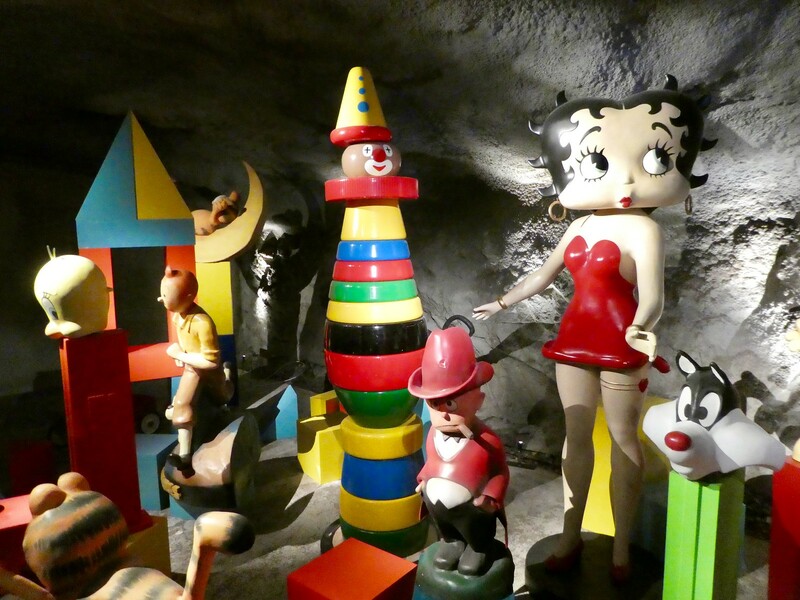 The Bergrummet Toy Museum adult entrance SEK 140 (£12.10) is located in an historical torpedo factory built underground. I’m always interested to seek out toy museums and this one in Stockholm contains a vast collection of toys and comics. A narrow, winding path through the cave takes visitors of all ages on a journey of sheer delight. The Bergrummet museum has only been open for one year and its toy collection was previously located in Tidö Castle, 70 km from Stockholm. After 43 years there, it was decided to move the collection to Stockholm to enable more people to visit and share the nostalgia. The collection contains toys from the 15th century up until those we recognise today and consists of 40,000 objects that have been collected by the Von Schinkel family. 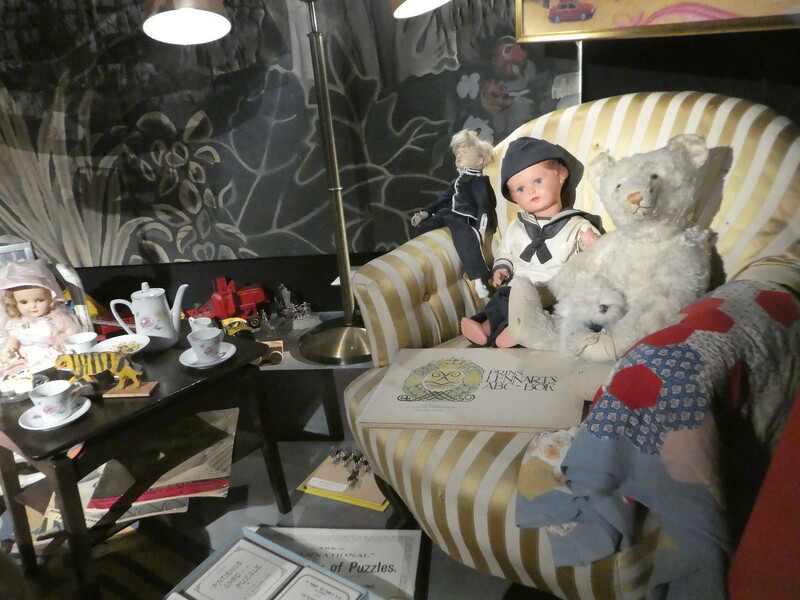 Those of you who are regular followers of my blog will already know of my love for toys and dolls and this museum which is the largest of its kind in Scandinavia is absolutely enchanting. 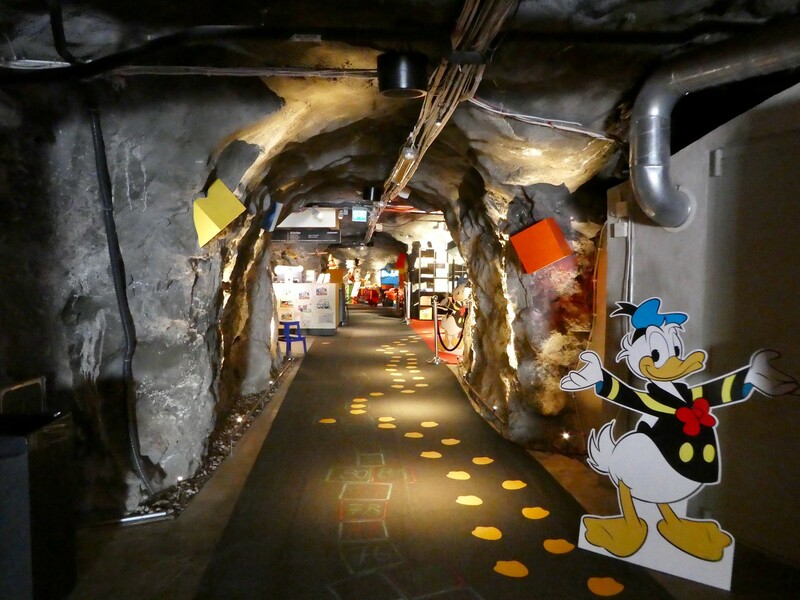 What can be more exciting and playful than exhibiting toys in underground tunnels? 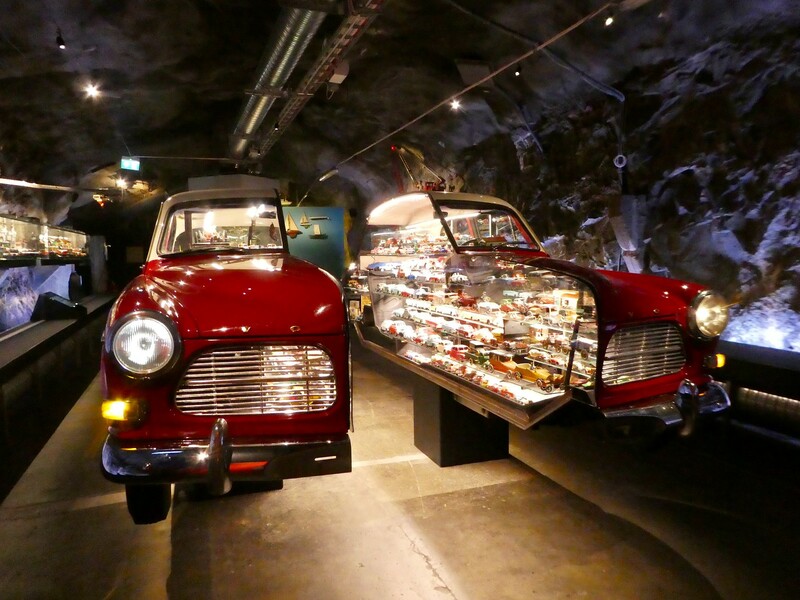 The toys are imaginatively displayed with a life size car sliced in half and filled with hundreds of small toy cars. Around another corner we found a model of a fairground carousel which bursts into life every few minutes with actions, lights and music. My husband took much pleasure in pointing out boxes of Meccano similar to those he spent many hours constructing objects with as a child. We felt very nostalgic exploring the vast collection of teddy bears, action figures, dolls, cars and toys and its unique underground cavern setting is a joy for everyone who is young at heart. Near the exit there is a gift shop and a cafe where a variety of board games can be borrowed including Chess, Snakes and Ladders and Ludo. 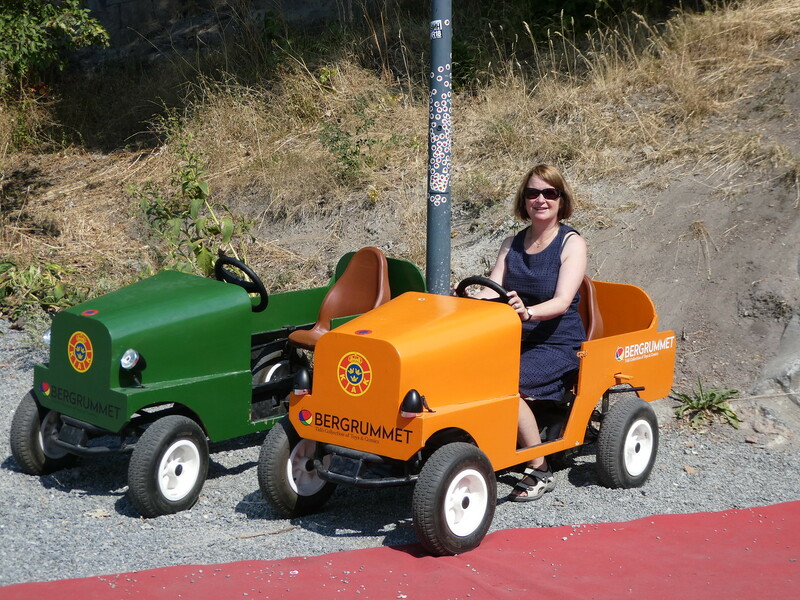 Just outside the entrance door are two toy cars and I couldn’t resist having a little ride before leaving this lovely, fun filled museum. Continuing our walk around Skeppsholmen, a little further on we came to ArkDes, Sweden’s National Centre for Art and Design. As admission is free we decided to pop in for a little look around. One of the permanent exhibitions on architecture in Sweden was thought provoking as it examined why Swedish buildings look as they do. Illustrated through exhibits we were able to view construction techniques used in Sweden over the last 1,000 years. A further gallery contained architectural scale replicas of historical buildings made from wood which was interesting as they included the City Hall and Royal Palace which we had already visited and were now familiar with. 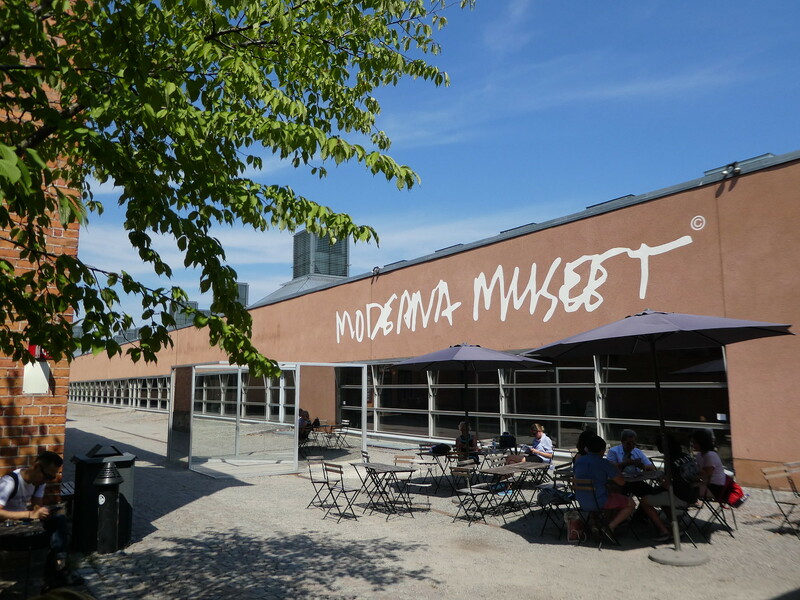 We then passed through some large glass doors and were surprised to find ourselves in the Moderna Museet (Museum of Modern & Contemporary Art) which has an inter-connecting door to ArkDes. A quick look around the permanent exhibition followed which is free of charge. 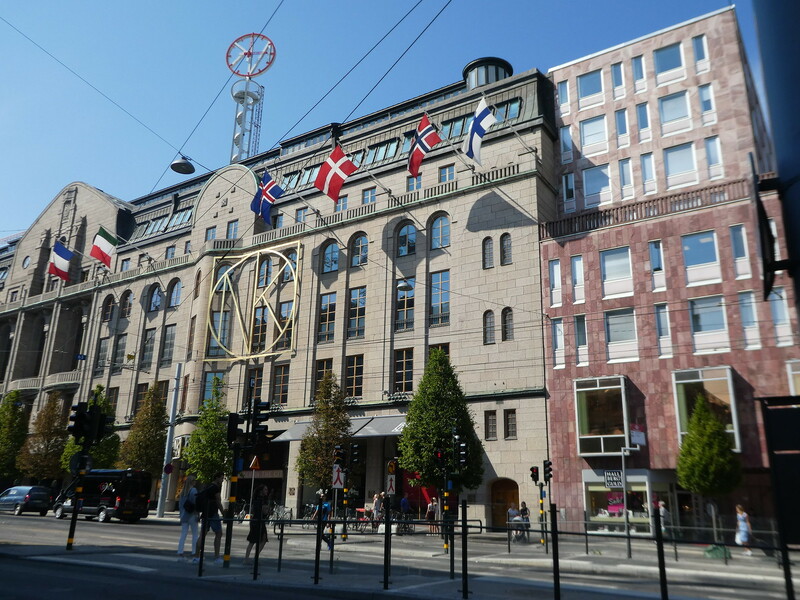 It was then time for some lunch and some shopping so we headed along to Hamngatan to the flagship store of NK (Nordiska Kompaniet) which opened in 1915. This luxury department store has a beautiful central atrium with access to all six floors. I started looking at fashion and then turned my attention to Scandinavian design as I like the Nordic shades of grey and blue and the simple lines. 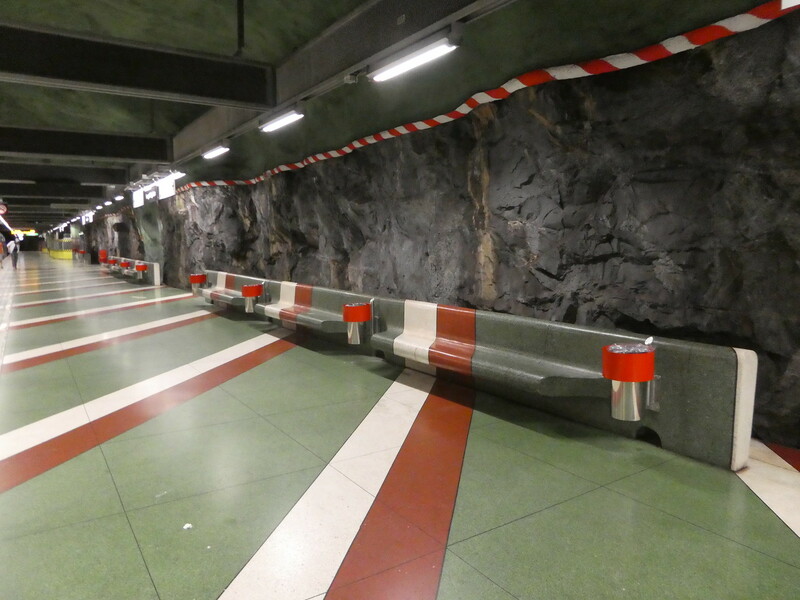 Before returning to our apartment we decided to view some of the artwork in Stockholm’s metro stations. Almost 90 % of the 100 stations on the 110 km network have some sort of art installation and the metro has sometimes been referred to as the world’s longest art gallery. 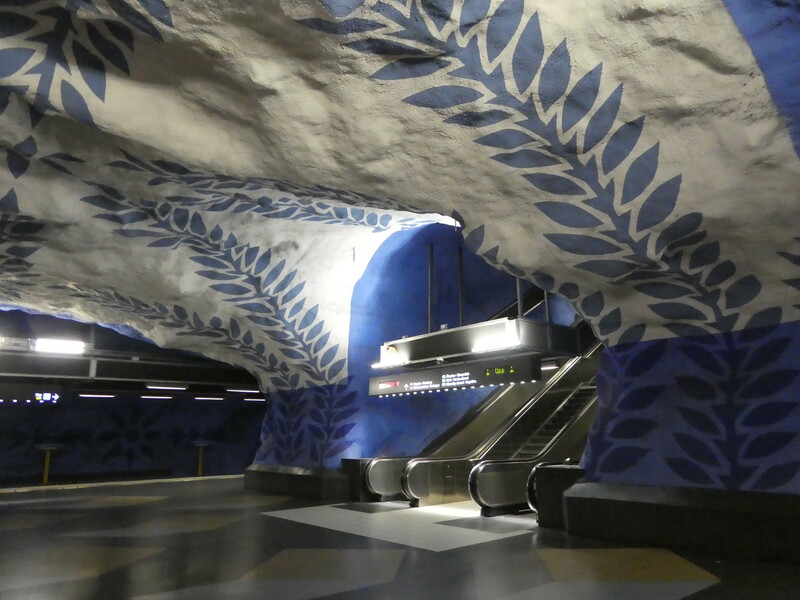 Stations have been decorated with paintings, mosaics and even sculptures by 150 artists since the 1950’s making it one of the most unusual and beautiful underground networks. Several of the best stations are on the blue line which we have been using each day since arriving in the city so we sought out the key platforms. We started our tour at Kungsträdgården where the station artwork has been designed around what is above ground with colours depicting the old French garden above. Hopping on the metro one station took us to T-Centralen which is Stockholm’s busiest station. The metro art here is also on its blue line where we admired walls hewn out of bedrock covered in blue leaves. Re-joining the metro we continued to the station near our accommodation at Solna Centrum which is also listed as being one of the most beautiful stations on the network. 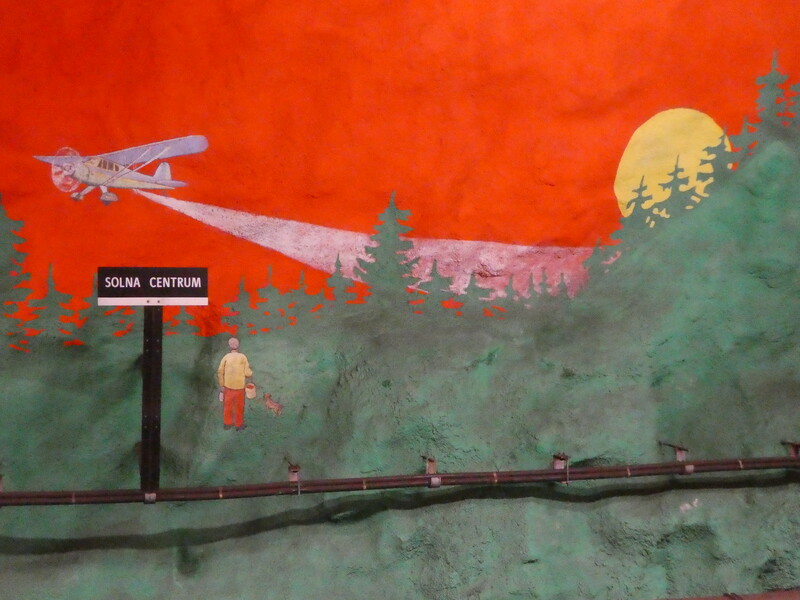 The exposed bedrock is painted in a vivid shade of red and contains an enormous mural along the entire length of the station depicting forests, nature and the environment. During the summer, free guided tours take place each Tuesday, Thursday and Saturday afternoon visiting several metro stations. We had considered taking one of these tours ourselves but thought we had covered most of the stations already. Visitors just need to have a valid ticket for travel on that day, more details can be found on the SL travel website. Thank you Sue,. the toy museum was enchanting and we found no end of nice things to do in Stockholm. How wonderful you have found another museum that you love. What a lovely place Stockholm is. And isn’t the metro just lovely. The Stockholm metro is beautiful Sue, so tastefully painted and I was so pleased that we managed to find that enchanting toy museum. There is also a wonderful Toy and Miniature Museum in Kansas City, Missouri. I also love toy museums. Thank you for the blog and list. It’s my pleasure and thank you for bringing the Kansas City toy museum to my attention. Perhaps I’ll manage to get here as well one day! Kansas City has several excellent museums. Even more reason for me to go then! Google World War 1 museum. And Nelson Atkins Art Museum. Stockholm amazed us with so many interesting things to see and do and the toy museum as one of the most imaginatively arranged I’ve seen anywhere. It’s my pleasure, thank you for your much appreciated comments too! Stockholm is going to be the on the top of my list after this! That’s great to read, I’m certain you will enjoy visiting Stockholm! Thanks Terry for your continued interest in these posts. A good excuse to return to Stockholm one day! My son-in-law works for US State Dept. Sweden is one of the countries within his traveling for work and I shall share this with him. You are a great photographer. Once again, thank you for our wonderful trip. It’s so lovely to read your positive comments and to read about your son-in-law’s work connections with Sweden. You’ve put Stockholm right up there on our list of places to go, loving following your trip. Actually on our way to Oslo right now so not that far away. Thanks Jonno for your ever welcome thoughts. I’m certain you will enjoy visiting Stockholm in the not too distant future. In the meantime enjoy Oslo! Just arrived and temperature is 15 degrees lower than Holland so bit chillier. Time for hats I think. I thought s too, I’ve never seen toy cars displayed like that. The entire museum was so cleverly designed and beautiful to visit! I really want to visit this part of Europe! Sounds like Stockholm is a wonderful city. I do hope you get an opportunity to visit Stockholm soon Jamie. It is such a beautiful city. Me too, it’s so close to him. I’ll have a schedule a visit next time I’m that way! Wow! The station art reminds me of the metro station art in Moscow. Thank you for your kind words. Toy museums always bring back nostalgic memories for me too. The metro stations are beautifully painted but not as ornate as those in Moscow. Looks great! I adore Stockholm. Thank you Paige, we had a splendid time at the museums on the island!